Mechanical Engineering at IIT Madras » Dr. Ramkumar, P.
Dr. P.Ramkumar joined as an Assistant Professor in the Department of Mechanical Engineering in IIT Madras in 2012. 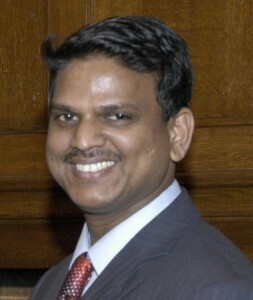 Prior to coming to IIT Madras, he was an Associate Professor at SSN College of Engineering, Chennai. Dr. Ramkumar received his B.E in Mechanical Engineering from College of Engineering, Guindy, Anna University and his M.Tech (Industrial Tribology) from IIT Madras. Later, he pursued Ph.D. from University of Southampton, UK and did his post doctoral fellowship in University of Leicester, UK. His research interests are in the field of tribology, including developing new materials and coatings for engine tribology, nano-lubrication, gearbox design, Electrostatic condition monitoring and developing new materials for brake application. Best Presentation Award, in “Mission of Tribology”, at national level, IMechE, London, 2005. Received EPSRC full scholarship for his PhD program at University of Southampton, UK. R Penchaliah, TJ Harvey, RJK Wood, K Nelson, HEG Powrie, “The effects of diesel contaminants on tribological performance on sliding steel on steel contacts”, Proceedings of the Institution of Mechanical Engineers, Part J: Journal of Engineering Tribology, 225: 779 -797 (2011). RJK Wood, P Ramkumar, L Wang, TJ Wang, K Nelson, ES Yamaguchi, JJ Harrison, HEG Powrie, N Otin, “Electrostatic monitoring of the effects of carbon black on lubricated steel/steel sliding contacts”, Tribology and Interface Engineering Series, 48: 109-121 (2005). P Ramkumar, L Wang, TJ Harvey, RJK Wood, K Nelson, E Yamaguchi, JJ Harrison, HEG Powrie, ” The effect of diesel engine oil contamination on friction and wear”, World Tribology Congress III, 537-538 (2005).